New Delhi has approved setting up of Integrated Check Posts (ICPs) at Sutarkandi in Assam along the India-Bangladesh border even as the ICP at Dawki along the India-Bangladesh border in Meghalaya is under construction. Disclosing this in the Rajya Sabha, Union Minister of State for Home Affairs Kiren Rijiju said “in principle” approval has been granted for setting up Integrated Check Posts at 10 other locations including Ghojadanga, West Bengal (Bangladesh border), Changrabandha, West Bengal (Bangladesh border), Fulbari, West Bengal (Bangladesh border), Jaigaon, West Bengal (Bhutan border), Panitanki, West Bengal, (Nepal border), Mahadipur, West Bengal (Bangladesh border), Hili, West Bengal (Bangladesh border), Banbasa, Uttarakhand (Nepal border), Bhitamore, Bihar (Nepal border) and Kawrpuichhuah, Mizoram (Bangladesh border). At present, two Integrated Check Posts (ICPs) are operational along the India-Bangladesh border. Rijiju said the Agartala ICP along the India-Bangladesh border in Tripura and Petrapole ICP along the India-Bangladesh border in West Bengal are under operational. 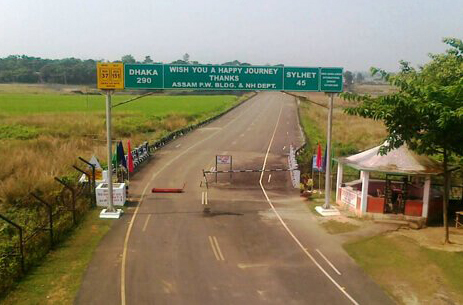 Sutarkandi is famous for having an International Trade Centre along the Indo-Bangla international border. Through the border along Sutarkandi, fruits, silicon and coal are exported to Bangladesh. The border area is falls under Karimganj district of Assam. Located 14 km away from Karimganj district of Assam, the area has a huge scope of tourism and the government of Assam is working on it. There is a principal custom check post for the trade flow. There are two National Highways which go through Sutarkandi. The National Highways are NH 151 (old) and NH 7 (new). The Indo-Bangladesh border at Sutarkandi is guarded by lots of Border Security Force (BSF) and Border Guards Bangladesh (BGB).